The seventh Midnight Rambler - this one more for “cruising, some racing... mainly having fun”. Crew consists of a core of six who have campaigned in Hobarts over 28 years now on those seven boats. “We are a bit long in the tooth now but still able to complete the course without too much embarrassment”, says Ed. “We do have two young guys at the front who have the flexibility and physical stamina we used to have!” Between them, Ed and crew can declare over 125 Hobarts, and have won every major offshore race on the east coast, including overall wins in the Gosford Lord Howe Island and Sydney Mooloolaba Yacht Races, both twice; and Sydney Gold Coast and Sydney Hobart Yacht Races, both once. 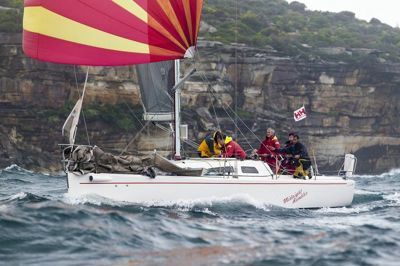 What used to be a mid-sized boat in the Hobart race is now the second smallest boat out there, but to the Rambler Syndicate, 36 feet is just fine. Their hope? To be competitive in division and beyond that, ‘Hughie’ will decide.